Small sleeper sofas are ideal for small areas where space is at a premium. Sofa sleepers are convertible pieces of furniture that can serve both seating and sleeping needs. If you live in a small space or if you need occasional sleeping arrangements for guests but don't have a guest room, a sleeper sofa can be a terrific option. A sleeper sofa offers buyers a smaller version of the larger convertible sofa, making them perfect options for cramped spaces. The styles and sizes of the included beds vary and can even include twin size beds. The pull-out sleeper sofa has been, and continues to be, one of the most popular types of sleeper sofas available. The sofa looks just like a regular couch, but when the cushions are taken off, a pull-out bed frame and mattress are visible. After being pulled out, the couch back functions as the headboard. While these used to only be available in the 3-seat style with queen mattresses in them, many now come in loveseat and "chair-and-a-half" versions. These can have double or twin mattresses. 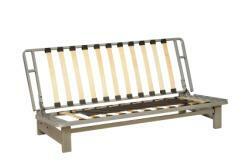 Another popular style is the fold-down design (similar to a futon). This type of sofa is all one piece with a thick upholstered cushion. The sofa itself is usually a slipper style (no arms) and the back folds down, forming a flat surface with the seat cushion. There are plenty of different styles available so if you're thinking of purchasing one, do some comparison shopping and learn what's out there. There are a few benefits to having sleeper sofas. Sleeper sofas are wonderful for maximizing space if you live in a small apartment or condominium. If you don't have a separate bedroom, you can keep your bed hidden when guests come over by converting it into a sofa. The living and sleeping areas can easily become one. A convertible sofa is great to have if you occasionally have guests come over to stay and you don't have a guest room. Guests won't have to spend money by staying at a hotel, nor will they have to spend an uncomfortable night on the floor. A sleeper sofa can be used in a home office as seating for clients and co-workers. When guests come to spend the night it can be converted into a bed. The office becomes a guest room and they get to have some privacy. Small sleeper sofas on the main floor can also come in handy if elderly relatives come to visit. For the elderly and people too weak to climb stairs (such as those recovering from surgery or illness), it can save a lot of trouble and effort. It used to be that major furniture retailers would carry a couple of pull-out sofas in limited styles and colors, but as they have become more popular, more and more stores are carrying them in large quantities. In fact, there are entire retail outlets devoted to sleeper sofas (such as Jennifer Convertibles) and other types of dual-purpose furniture. Manufacturers like Lee Industries also have a wide selection that can be custom made in any fabric and they are sold in many furniture stores large and small. Convertible sofas are great pieces of space saving furniture, providing seating during the day and a comfortable bed at night. They're available in just about any style, and can be custom made to suit your needs. Depending on what you want, they can either make a grand statement in a prominent spot, or take up minimal space in a tiny corner.